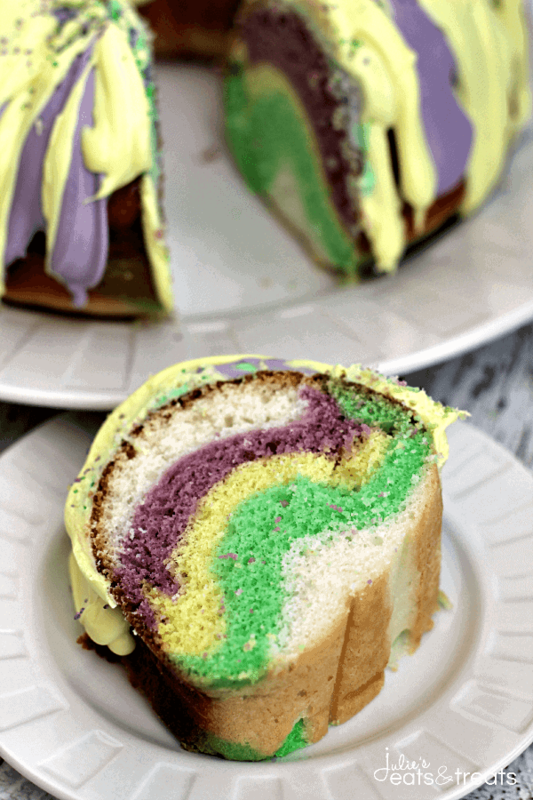 Springtime Swirl Cake ~ Easy, Moist and Delicious Cake Perfect to Welcome the Days of Spring! So I’m kind of over Crock Pot dishes, casseroles and comfort food. I’m dreaming of grilling, pastels, and Easter dishes. Ohhhh and Cinco de Mayo of course! Yum! Winter. Your done and over with so just go away and let spring come roaring in at Julie’s Eats & Treats! At least if the weather doesn’t want to coporate we can hang out here and act like it’s spring right? This past weekend it finally warmed up here. We are talking 50 degree weather on Sunday. It was heavenly. No jacket type of weather. Then the snow started melting off the roof and we never got gutters on this winter. This equaled the water getting lodged between the house and the snowbank as it rushed off the roof. Guess where it went next? Yup, our basement. Awesome huh? Our newly finished basement as of last fall. Just the phone call you want from the hubs. Luckily it mostly was in the unfinished back storage room and we were able to blow the snow away from the house to prevent more damage. They also got the torch out, warmed the ground and dug a canal for the water to drain away from the house. Rudimentary my friends but oh so effective. That was the exciting day at the Evink household. This last Friday was the cabin sewer being froze. That will be a whole other post! We were full of awesome fun this weekend! Did you have to ruin my moment? It is Minnesota. I better not get to excited…. So if it does happen to blizzard again I’m just going to pull up pictures of this pretty, spring cake that gets me all happy and excited about green grass, playing at the park and warmer weather!! Who’s joining me in this theory? Prepare cake mix according to package directions. Divide evenly between four bowls. Dye one bowl purple, one yellow and one green, leave one of them white. Grease a bundt cake pan. Pour half of the white cake mix on the bottom of bundt pan. 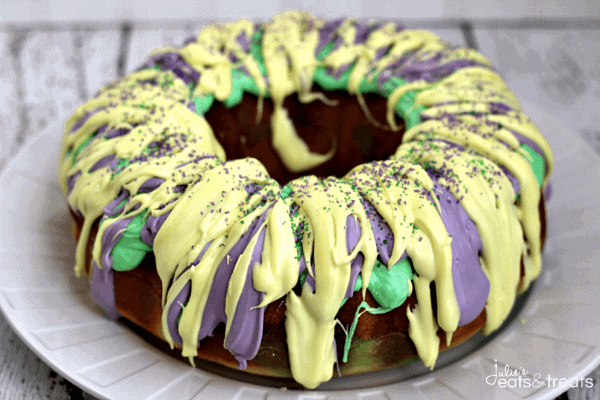 Pour purple over the cake mix, top with yellow cake batter, then green batter and finally the last of the white batter. Let cool completely in bundt pan. Flip out on to serving platter. Warm white frosting at 20 second increments until it's warm enough to drizzle. Do not over warm, if you do let cool a bit. Divide evenly between three bowls. Dye one bowl green, one yellow and one purple. Drizzle over cake and let sit until frosting has cooled and is set. 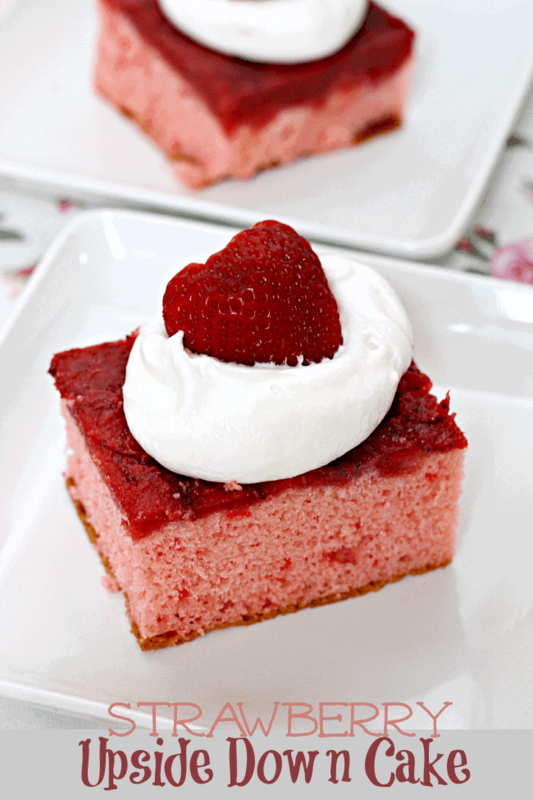 Strawberry Upside Down Cake ~ A Layer of Fresh Strawberries Tops off this Easy Cake! 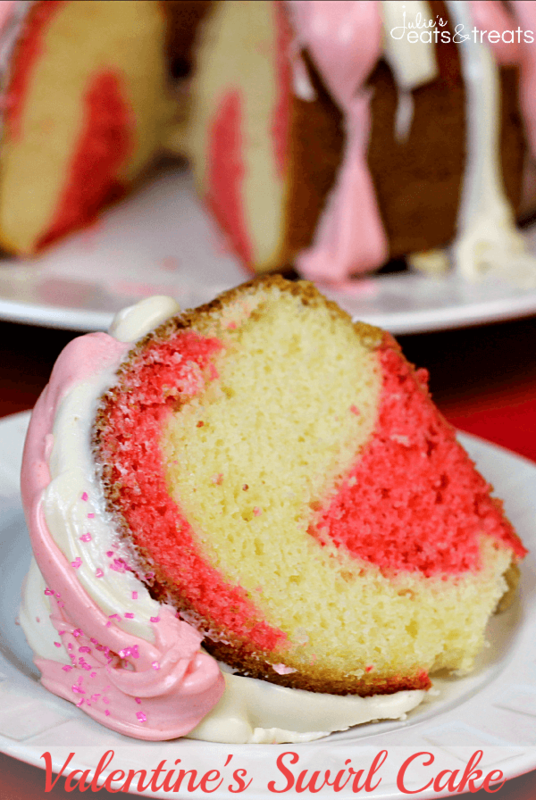 Valentine’s Swirl Cake ~ Super easy box cake and frosting dressed up for a festive Valentine’s Day treat! 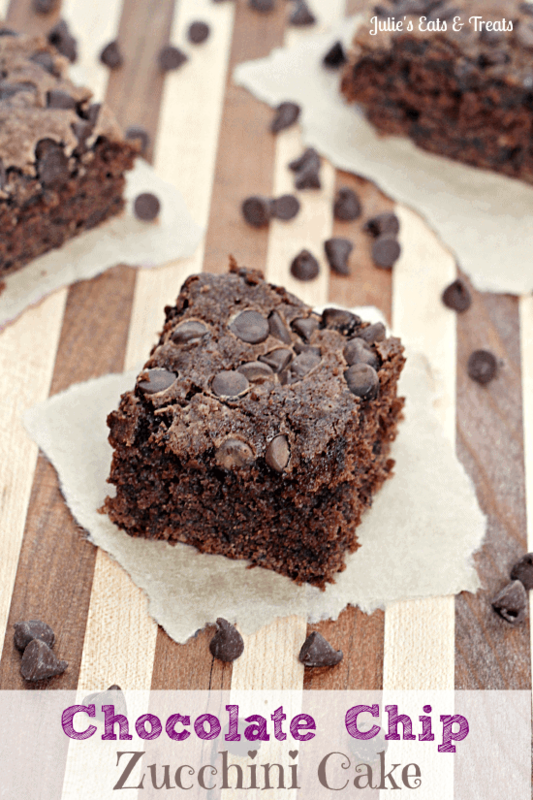 Chocolate Chip Zucchini Cake ~ Zucchini keeps this chocolate cake moist and scrumptious! All I can see are pictures – who’s hiding the recipe?? Ahhh so sorry! It’s fixed…it auto posted and the link was broke. Thank you for bringing it to my attention! That cake is beautiful and I’m sure it tastes delicious! I am with you too dea…I am done and over with winter. Despite the snow still outside. I am all about spring recipes now and this cake is making me very happy!! So so beautiful!! I think a whole lot of us feel like this! Wow this cake looks intense 🙂 Great color and flavor combo, love it! Checking it out from wake up wednesdays! Boy is that festive! It’s so springy!